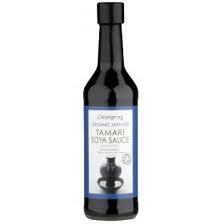 Tamari is a Japanese soy sauce made without wheat. It tends to be a far superior product to what you normally find on the shelves. A lot of people do not realise that soya sauce contains wheat, where as tamari is wheat free and gluten free. You can also find this product with reduced salt. For an example of how to use this see Tamari seeds. This entry was posted in Tamari and tagged tamari, wheat free. Bookmark the permalink.